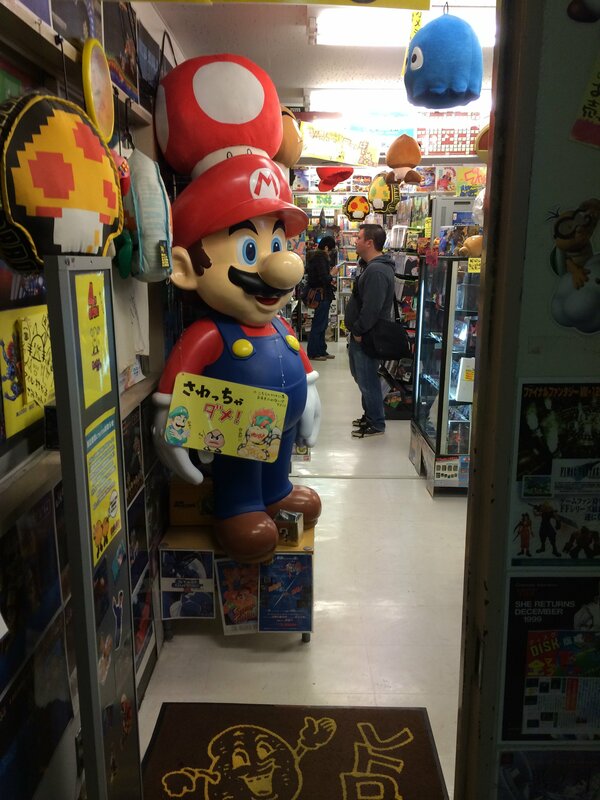 Today’s photo of the day comes from one of the best places to purchase retro video games and their related merchandise in Tokyo. The place I’m talking about is Super Potato located in Akihabara, Tokyo’s largest electronics district. Nothing screams “retro” gaming more than the iconic Super Mario. Looking for Final Fantasy III or perhaps a Super Mario Pocket Watch? Or perhaps that incredibly-rare-snes-game-only-you-played. You will find it at Super Potato, on one of their several floors. Each floor contains different types of games from Atari to the original Nintendo. Walls are covered in advertisements for old games and other random related material. First you will have to find the place, it’s a tad difficult if it’s your first time in Japan, so much so that a video was made how to find it. It is difficult to explain this one of a kind store , you have to experience it yourself. If you grew up gaming, then make sure to add this to your list of places to visit when you are exploring the urban jungle that is Tokyo. More photos can be found on Flickr and make sure to subscribe to my journey in Japan. Now, if you don’t mind, I have to go take out a loan so I can go buy a sealed copy of the original Bubble Bobble on the NES. Christmas means many different things to everybody from family to commercialism, and everything in between. For myself, Christmas is about spending the holidays with my family and friends. Which is funny since I’m spending this Christmas in Japan, away from home. Back home in Canada during the holiday season you see the standard fare for decorations on people’s homes and in all the stores. 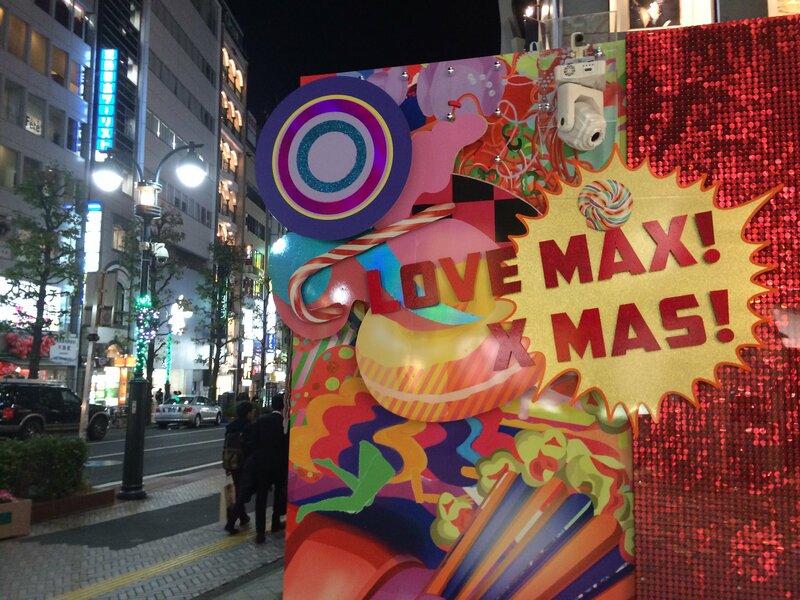 Here in Japan the stores are decorated to the MAX (you’ll see why I keep using that word in a minute here) for Christmas. There are Christmas trees, stockings, elves, Santa, and everything else you can think of to associate with the holiday. Even though Christmas is not holiday here the decorations are really something to see. This brings me to the photo of the day. Taken outside of a PARCO department store in Shibuya, Tokyo. It really has nothing to do with Christmas, yet it does, all at the same time. If you managed to get this far you should really subscribe and have the updates sent directly to you. If you follow me on Instagram or Twitter you know I share quite a few pictures. Especially since moving to Tokyo. While those are great for sharing photos in the moment, it’s difficult to put any deep explanation of the photo being shown. So, with that I’m going to give one and explain every last thing about it and why it’s significant to my daily life here in Tokyo (or wherever I may end up). I’m a huge Starbucks fan, and I will admit it’s a bit of a comfort when I’m feeling homesick. We all enjoy something that is familiar and take comfort in it. While I’m all for getting out of your comfort zone and experiencing new things, somedays having something (somewhat) familiar is welcomed. Are you having it in or taking it out? Did you want your [pastry name] heat? Do you want a mug? The first time I went into Starbucks on my own, I completely messed up and was unaware that I needed a table before I could order if I wanted to stay. The girl first told me in Japanese, but I was a bit flustered and didn’t quite understand her. She then switched to English and explained the entire process to me. I won’t lie, I did feel a bit stupid for not understanding her when she first told me in Japanese. Now that I’m completely aware of how the system works I go into Starbucks now fully confident in my ability to order in Japanese and know to get a table if I want to stay in. So, now it’s a place of comfort just like it was back home in Canada. 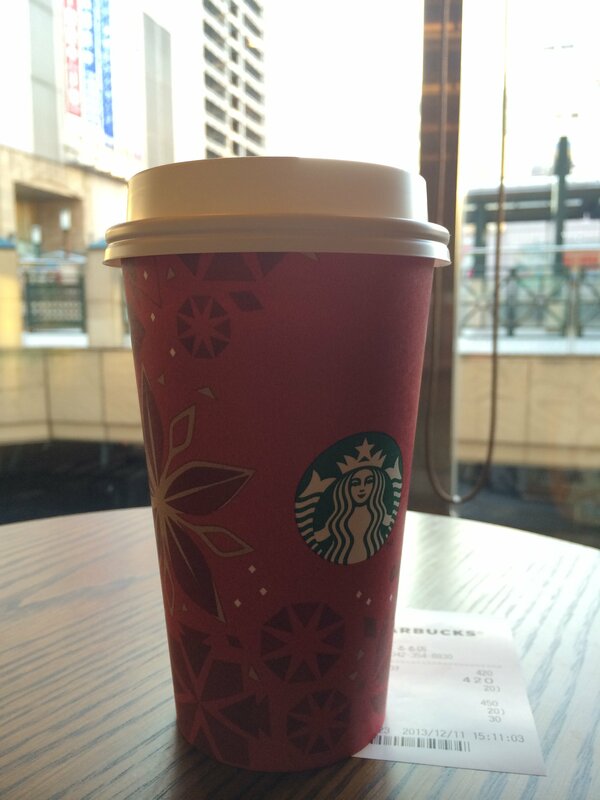 Now, if only they would get the Eggnog Latte here, but I don’t see that happening. For now, the Crush Marron Pie Latte will have to do. If you enjoy my ramblings then make sure you subscribe and have updates sent right to you (because I know you’re lazy just like myself).